Richie Wise, Kenny Aaronson and Marky Ramone; three names very synonymous when it comes to the landscape of popular music in the past forty years. When we think of Richie, we think of his production work with everyone from KISS to Gladys Knight. Aaronson we know from being a member of '70s soft rockers Stories as well as a sideman for the likes of Bob Dylan, Rick Derringer and many others. And Marky...duh...he's a Ramone! 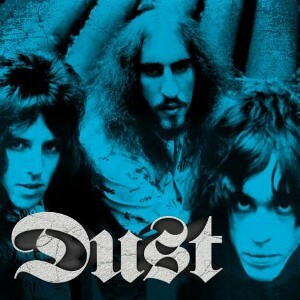 Before all those moments though, these three guys were in one of the heaviest and loudest bands to emerge from Brooklyn in the early '70s, Dust. The two records the band released in their time of existence, Dust (1971) and Hard Attack (1972) are something of a secret handshake among those who like their rock deafeningly loud, excruciatingly heavy and hopelessly obscure. But these sounds will be regulated to strictly the collectors no more! Next month on the 16th, Both records will be made available on a single CD by Legacy Recordings, complete with a total re-mastering job. For the vinyl junkies, both LP's will be pressed up on record as Record Store Day exclusives. When Noisecreep heard the news of these classic slabs of proto-metal being re-issued, we immediately put out feelers to talk to the members and get the skinny on Dust. Well, we truly lucked out when Marky Ramone himself agreed to sit down for a chat about the origins of the band, the recording of both albums and his relations with famed rock critic, Lester Bangs. With a band like Dust, everyone knows where the members went, but they don't really know how you formed. Give us some insight into that. We were just three teenagers from Brooklyn who loved stuff like Led Zeppelin, Jimi Hendrix, Cream, Jethro Tull, and The Yardbirds. Kenny and I went to the same junior high school. We met Richie later on Parkside Avenue; that's where all the local Brooklyn musicians hung out. Were there any Brooklyn bands that were similar to what you were doing? In 1970 there were no real heavy metal bands in America, and here we were, these 18-year-old kids playing five/four time signatures. The leads Richie was doing at his age was amazing. He was the first guy in Brooklyn to have a Marshall. How did things lead into getting signed to Kama Sutra? We were very naïve. We weren't savvy to the music business yet. We started playing small places like Flatbush Terrace headlining. From there, we got interest from the label Buddha/Kama Sutra, which eventually turned into Casablanca Records. Neil Bogart was the president and he liked what he heard. The label was having hits and they were making good money, so we went for it. What are your memories of recording the first album for the label? First we had to rehearse the songs. Where did we rehearse? Mainly in my parents basement on Ocean Parkway. In those days, rehearsal studios weren't that fully equipped; you had to bring your own stuff. So, if we wanted to rehearse somewhere, I had to lug my drums on a dolly to the train. Then, when we got to the studio, I had to bring the drums from the street to the top of the stairs. So after rehearsing in my parents' basement, we went into Bell Studios and recorded the first Dust album and deal with whoever we had to deal with as an engineer. Not that many people in America knew how to produce that kind of music yet. You have Blue Cheer, but those records weren't the greatest recordings. You can hardly hear the drums! So there was a lack of producers in America who knew this music. But we plowed through the songs and did the basic tracks. Then Richie overdubbed his vocals and his leads. Kenny overdubbed slide and dobro over his bass. That was Dust's first album. Who did you tour with once the album was out? We did some shows here and there with Alice Cooper. We did some shows with Wishbone Ash and John Mayall. Our manager wasn't experienced, but we stuck by him. When the first album came out, the reviews were good. Wherever we played, people loved it. We had to do a second album because it was in our contract. We really felt later on that it was the wrong label to be on. They catered to bubblegum groups. They had some good groups too; they had the Lovin' Spoonful who had great songs. But maybe if we were a little more patient, we could have been on an Atlantic or a Warner Bros.
What do you remember about the making of that second album, Hard Attack? So, you really don't think there were any bands in America at the time that was similar to Dust? Maybe Sir Lord Baltimore. Vanilla Fudge were a band playing heavy covers of soul music. Their version of 'You Keep Me Hangin' On' is great, but would you would consider that heavy metal? One rock critic who really loved you guys right off the bat was Lester Bangs. He wrote a great review of the first album and then did a feature on you guys in Creem. He was a great guy and became a great friend later on. This was a time when the whole 'lite rock' thing was really taking off, so for someone like Lester to give you the seal of approval was a great thing. So why did it take so long for these records to get properly re-issued. Sony bought the rights from a German label named Repertoire. When I found that out, I said 'Let's do this the right way.' It sounds great and we got some great pictures and everything. It'll be worth the wait. The Dust reissue CD can be pre-ordered here.